We like to get crafty here at Little Worlds Interactive, and we decided it was time to bring one of our monsters out of the screen and into the real world. Say hello to Glizzard, one of our many shenanigan-filled trouble-making monsters. Make your own Glizzard to bring some hijinks into your own home! 1. Print out the papercraft template on the card stock. Download the template here. 2. Cut out all of the pieces - the body, the tail, and the two ears. 3. Take the body and fold along all the major lines. You want to fold everything back (a mountain fold), except for the feet, which you want to fold forward (a valley fold). 4. Line the large tab up with the back of the monster's face, so that it forms a box. Glue this tab into place. 5. You should now have three tabs along the top, with a flap for the top of the monster's head. 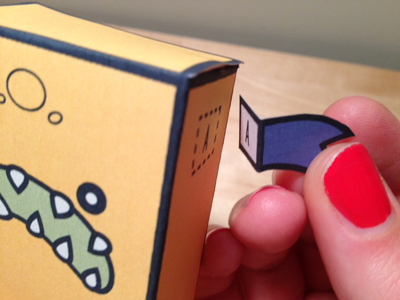 Add glue to these three tabs and press the flap down onto them to complete the monster's body. 6. Find the monster's tail. Fold along the lines and glue the tab shut. 7. Glue the "C" part of the tail to the "C" part on the back of the monster's body. The tail should be facing right if you're looking at it from the back. 8. Fold the ears and line up the "A" ear with the "A" region on the body, and the "B" ear with the B region on the monster's body. Now you just need to glue these together, and you're done! What kind of adventures has your monster been up to? Let us know on Twitter!